Peter Blaha (middle), Head of Sales Bus at MAN Truck & Bus Österreich, handed over the MAN buses to executive director Mag. Dr. Ludwig Richard (left) and Mag. Johann Strasser (right), technical director at Dr. Richard. 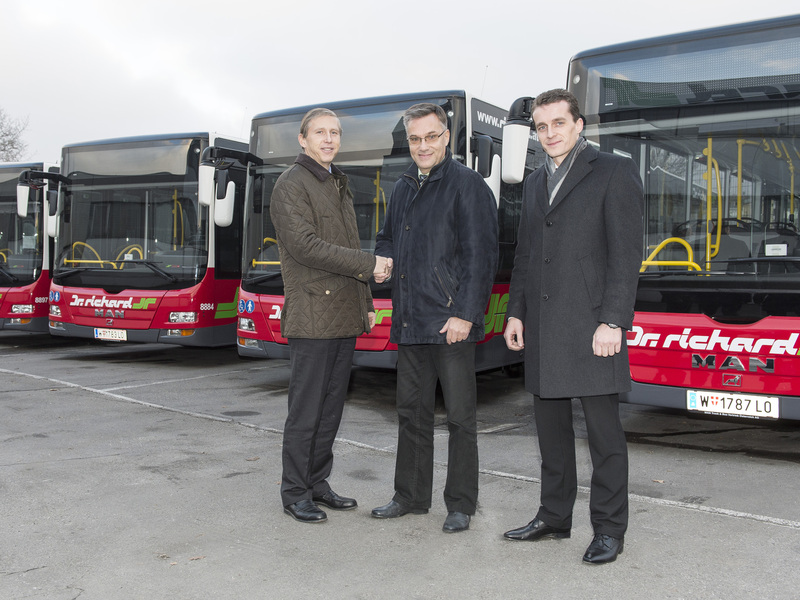 Austrian passenger transport company, Dr. Richard, has placed orders for 64 MAN Lion´s City buses. The company operates routes on behalf of Wiener Linien and has relied on MAN vehicles for 40 years now. MAN's Lion's City impressed in vehicle tests when compared with the competition: Together with the great value for money which the buses represent, low fuel consumption was also of key importance in Dr. Richard's decision to opt for MAN. 15 vehicles are already in service between Rennbahnweg and Prater. The remaining buses are scheduled for delivery in May 2014. MAN's Lion´s City buses comply with the Euro 6 emission standard. “After several test runs using Euro 6 buses, MAN impressed both in terms of fuel consumption compared to the previous model and also in regards to their tried and tested technology. The comparatively lower life-cycle costs was ultimately a key factor in our decision. We are now able to draw on the initial experience from regular service with the buses and at this time feel vindicated in the decision we have made” said Mag. Johann Strasser, Technical Director at Dr. Richard. The 12 metre-long MAN Lion´s City low-floored buses are powered by a 320 HP engine and fitted with the ZF EcoLife six-speed automatic transmission with topography-dependent control. With two doors, they can accommodate 87 passengers, providing seating for 34. Mobility-impaired passengers can take advantage of a double wheelchair space. The air-conditioning system with 33kW cooling capacity ensures comfortable temperature control on warmer days. A passenger information system assists in route management. For security reasons, the driver's cab is separated from the passenger area by a glass door. Two additional, 10.5 metre-long MAN buses are used on routes with particularly narrow or winding streets. Dr. Richard is Austria's second largest bus company with a fleet of around 800 vehicles. In 2005, Dr. Richard was one of the first customers worldwide to take receipt of city buses from the MAN Lion´s City range.